The Punjab Cabinet in its first meeting approved the historic Excise Policy for the year 2017-18 reducing the number of liquor vends as promised before polls. The vends have been brought down from 6384 to around 5900, even as operation of all liquor vends within 500 metres from National and State Highways has been banned. 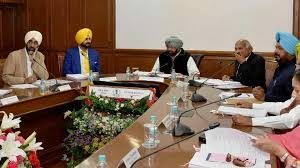 The maiden meeting under the leadership of Capt Amarinder Singh it was decided to abolish the system of wholesale licence L-1A. The new excise policy aims to tackle the problem of alcoholism as the quota of country liquor has been reduced from 10.10 crore proof litres to 8.70 crore proof litres i.e. by 14%. Also. the quota of Indian Made Foreign Liquor (IMFL) has been reduced from 4.73 crore proof litres to 3.80 crore proof litres i.e. by 20%. A spokesperson of the Chief Minister’s Office said that in compliance with the orders of the Supreme Court of India, no liquor vend would be allowed to operate within a distance of 500 metres from the outer edge of National Highways and State Highways. It was decided by the Cabinet that the first session of the 15th Vidhan Sabha of Punjab will be summoned at 2 p.m. on March 24, 2017. The Cabinet also authorised the Chief Minister to approve the Governor’s address for the first session. A spokesperson said that the newly elected members of the Vidhan Sabha would be administered oath on March 24 and 27. The election of Speaker and Deputy Speaker would be held on March 27, followed by Obituary references to the prominent dignitaries, who passed away during the intervening period of the current session. The Punjab Governor would address the Vidhan Sabha on March 28, followed by a debate on the Governor’s Address and Motion of thanks, besides presentation of Supplementary Grants for year 2016-17 and the Vote on Account for 2017-18 on March 29, he said. In another decision, the Cabinet okayed the terms and conditions for the appointment of Suresh Kumar, IAS (Retd.) as the Chief Principal Secretary to the Chief Minister in the rank of Government of India’s Cabinet Secretary.